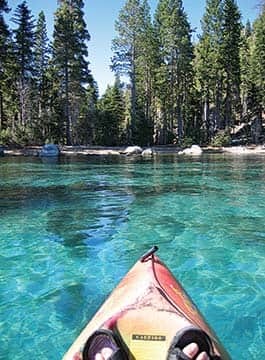 One of the best ways to enjoy the lakes of the Sierra is to get out on the water on a kayak or paddleboard. It’s spectacularly beautiful and the world floats by quietly and peacefully. Here are a few tips on places to go. In Carnelian Bay, find short, rocky beaches on either side of Sierra Boat Company. 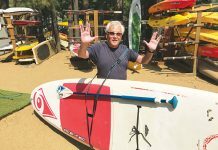 On the east side at Patton Beach, you’ll find food, rentals and lessons at Waterman’s Landing. I like to head northeast around Flick Point toward Tahoe Vista. To the southwest, find Dollar Point and eventually Lake Forest, and, for the truly hearty, Tahoe City. Taking in the view at Bonnie Bay just north of Emerald Bay. What could be finer then paddling from the sandy beach of D.L. Bliss State Park to Emerald Bay? Well, some might say Sand Harbor, but it’s certainly a toss up and they are both amazing. First, to make your journey at Bliss a success, you need to get there early before the parking lot fills, and the earlier you get there, the more likely you will find a spot close to the beach. Your 3-mile paddle to the south brings you past secluded coves, osprey and eagle’s nests, and a shoreline bereft of a road, to the entrance to Emerald Bay. Find your piece of heaven by beaching at one of the private coves, or make the turn into Emerald Bay itself and head along the northern shoreline toward the boat campground and Vikingsholm Castle. Caution: Inside the bay can be a busy place. Powerboat drivers mesmerized by the view of the bay and Mount Tallac might not notice you. Keep close to shore and make sure that all boats see you. 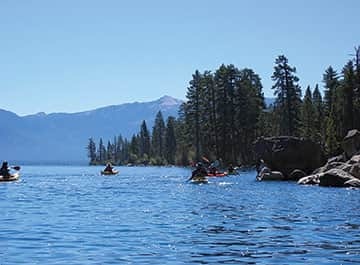 While kayaking all of Lake Tahoe is a multi-day adventure requiring stamina and logistics, circumnavigating Donner Lake is a spectacular jaunt that anyone with a few hours and basic paddling skills can take on. You can start wherever you choose: West End Beach, Donner Memorial State Park or from any of the public piers along the north shore of the lake. Wherever you go, it takes a few hours to circle the lake, or just do an out and back wherever you want to go. The views are both jaw dropping (the crest of the Sierra reaching high above) and interesting (the varied and fascinating homes, and people watching on the piers). Before setting off, check the wind direction, and paddle into the wind to start so that you can take advantage of the wind pushing you back home. About 3½ miles south of Tahoe City on Highway 89, you reach the first expansive view of Lake Tahoe at Hurricane Bay. Find your parking spot along the road, and then gently carry your craft across the busy bike trail to the rocky beach. Head to the north and pass by monstrous mansions, Ward Creek and eventually Sunnyside Lodge, or go south past parklands, Blackwood Creek and Fleur Du Lac. This summer’s bad news for motor boaters might be good news for kayakers and paddleboarders. The popular Sand Harbor boat launch is closed because of low water levels for motorboats, but kayaks and paddleboards are welcome. But, get there early as parking fills up fast. 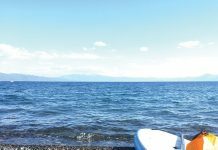 There is no place as beautiful in the world to be on a kayak or paddleboard then the waters along the East Shore of Lake Tahoe. The combination of the spectacular boulders and the meeting of the green and blue waters is truly breathtaking. Start paddling to the south, passing the Sand Harbor Beach, and head close to shore toward the Thunderbird Lodge. The unique stone Lodge was built for eccentric millionaire George Whittell, who once owned a big chunk of the East Shore. Or you can head north, also a beautiful journey toward Incline Village. Next to Sunnyside Lodge on the West Shore sits a small National Forest campground beach with picnic tables and restrooms, and easy access to the water. The West Shore Market nearby has the forgotten items or sandwiches to go. Paddle north toward Tahoe Tavern and Tahoe City, or south toward Hurricane Bay. Caution: Parking is limited and is quickly grabbed up by Sunnyside patrons and members of the Tahoe Park Beach located next door. 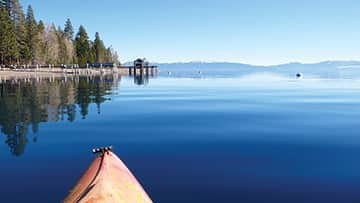 Why stop with just one day, when you can spend a week and chalk off a bucket list item by paddling around Lake Tahoe? 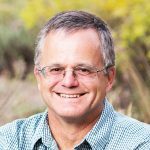 Visit laketahoewatertrail.org for tips on launching sites, camping, private property restrictions and amenities along the route. You’ll also want to pick up a copy of the Lake Tahoe Water Trail Map to take with you.